The Tilth Conference is fast approaching and there are scholarship opportunities for students to attend! 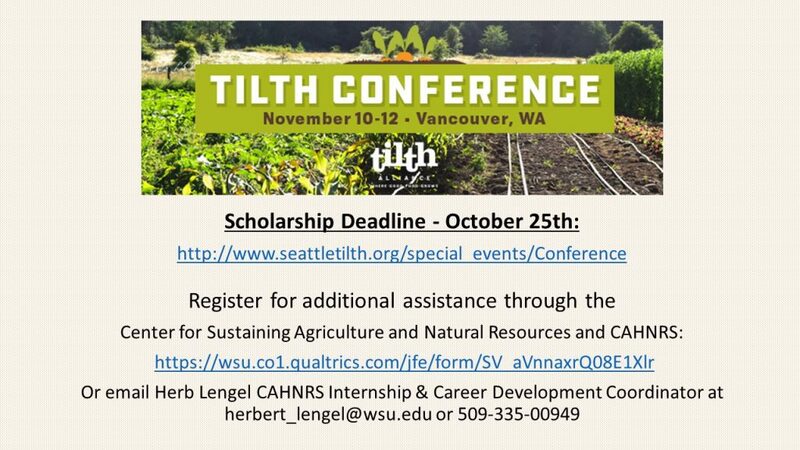 Scholarships for registration and meal fees are being offered by Tilth Alliance (application deadline Oct 25) HERE. Additional assistance is available from CSANR and CAHNRS to help cover travel and lodging expenses. To be eligible for these funds students can complete THIS FORM. For additional information please contact Herb Lengel, CAHNRS Internship & Career Development Coordinator at herbert_lengel@wsu.edu or 503-335-0049.